Entuitive has an ongoing, collaborative commitment to further the field and our own practice in structural fire engineering with a focus on performance-based solutions. In March 2015, Entuitive announced a fire engineering research project in collaboration with Carleton University that was undertaken as part of Entuitive Engineer Matthew Smith’s graduate studies and supervised by fire engineering expert Dr. John Gales. Since that time, we have actively grown our knowledge of how real fires effect structures. We continue to advance the way we define appropriate fire scenarios for structures, determine realistic temperatures to be expected in the compartments, and assess the resulting performance of the structures from these fire load cases. The first aspect of assessing a structure for fire is defining what the fuel load could potentially be in that structure and determining the resulting structural temperatures. 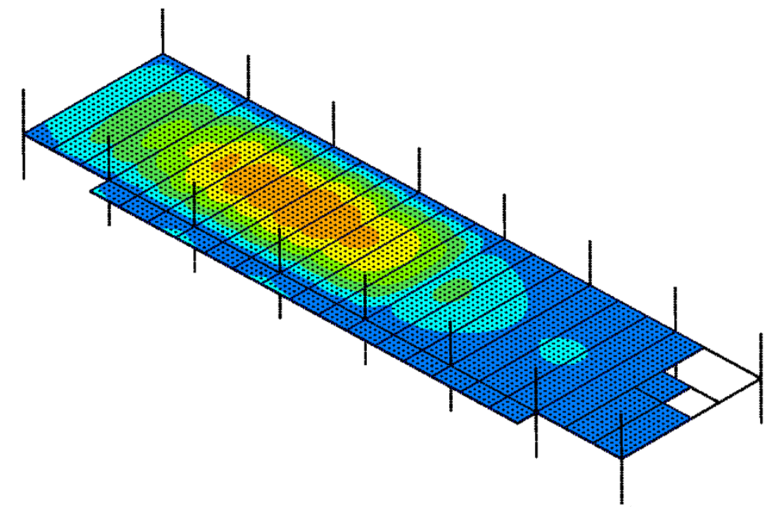 While CFD models have been well discussed and utilized in the literature, there is potential to use simpler, accepted analytical correlations to define localized or traveling fires in compartments. An approach developed in-house at Entuitive that leverages BIM to define design fires was recently discussed by Matthew Smith and John Gales in Advantage Steel Number 56, a publication by the Canadian Institute of Steel Construction (CISC). Find the full article here. Matthew and John presented at CISC’s first ever National Steel Symposium earlier this year. Their talk, “Safer and More Economical Building Designs Resulting from Actual Fires”, looked at real fires which contributed to our understanding of real fire dynamics and real structural response to fire, assessed the current state-of-the-art approaches internationally in fire design, and presented principles used in structural fire design. The presentation included preliminary results of Matthew’s graduate studies including lessons learned from a hypothetical Canadian building design that used contemporary structural fire strategies to achieve an alternate solution. The talk received positive feedback from those in attendance and sparked insightful discussion at the evening reception that followed. We are pleased to share that Matthew has since been invited to join the working group for Annex K of CAN/CSA-S16, “Structural design for fire conditions”. Once the design fires have been determined in conjunction with all the stakeholders and the structural performance for various fires has been quantified, the question of reparability comes up. Not only must a structure perform during a fire for life safety and property protection, but it is crucial to understand the scope of repair required ahead of time so that tenants and owners can prepare for this in their business continuity planning. For this reason, Entuitive is pleased to announce that it has partnered with John Gales at Carleton University and CISC to secure a multi-year, peer-reviewed NSERC grant that will look at the resiliency of structures for fire in collaboration with European partners. More information on this novel research will be disseminated in the future. In the meantime, the project is looking to engage interested and qualified MASc candidates to help undertake the research. Any interested candidates are encouraged to reach out to Matthew Smith or John Gales to learn more about the project. Entuitive has also been successful in engaging with the fire engineering community through membership on the ASCE Fire Protection Committee and the newly formed CSCE Fire Behaviour and Safety of Structures Committee. These committees are currently developing design guidelines for structural fire engineering that will ensure all stakeholders have access to a common industry consensus when producing or evaluating performance-based structural fire designs. Learn more about Entuitive’s Fire Engineering services here or contact Matthew Smith.